While certainly effective, the turbocharged flat-fours found in the 718 Boxster and Cayman ranges aren’t exactly tuneful, are they? Thankfully, however, there some 718 Boxters and Caymans with healthier cylinder counts. We’re talking about the new Boxster Spyder and Cayman GT4, both of which are expected to be powered by a detuned version of the 991.2 911 GT3’s 4.0-litre, naturally-aspirated flat-six. Praise be. 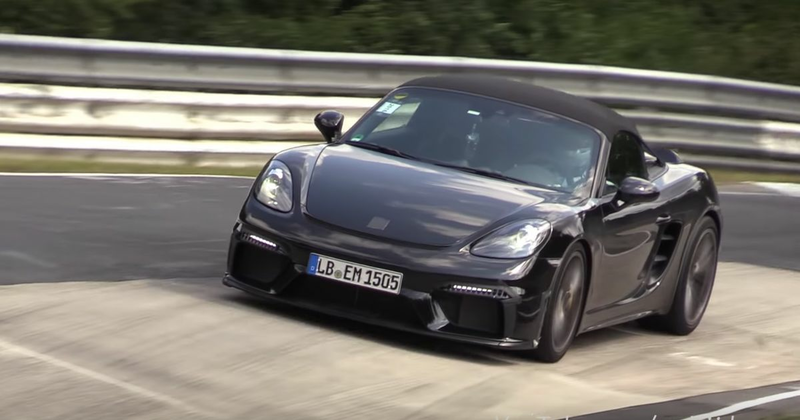 The Boxster Spyder can be seen testing at the Nurburgring in this video, and while the revs are - sadly - being kept quite low, the exhaust note is definitely not of the four-cylinder variety. Some of the YouTube commenters seem to think it’s been fitted with the 3.0-litre flat-six from the 911 Carrera, but this is something we doubt - Porsche has previously told us that it’s impossible to package the twin-turbocharged unit with extensive and costly changes to the 718. We should hopefully be seeing the car in full either later this year or early 2019, along with its Cayman brother. We can’t wait.